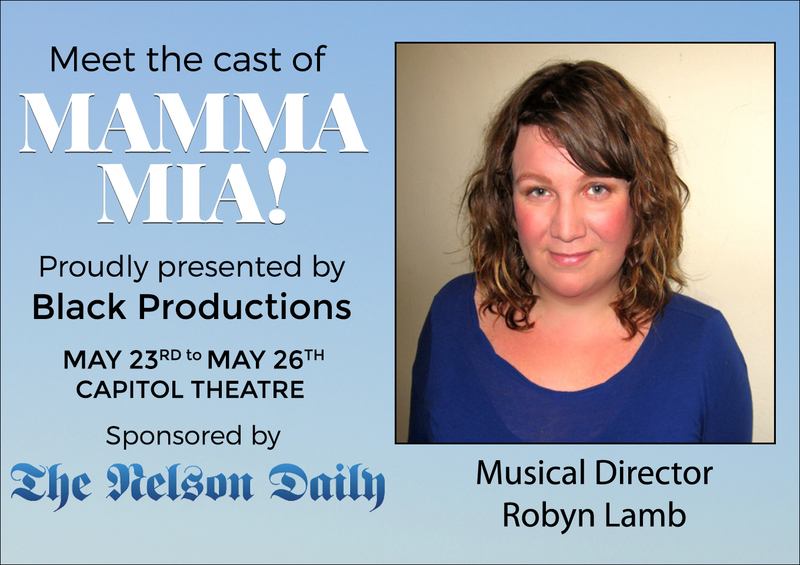 BLACK PRODUCTIONS, the company that brought you Grease, Hedwig and the Angry Inch, Chicago and Cabaret, Rock of Ages and Steel Magnolias is proud to be bringing MAMMA MIA to the Capitol Theatre stage May 23-36, 2019. MAMMA MIA is a stage production where a young woman wants to invite the father she's never known to her wedding — only to discover that there are three possible choices — in this musical featuring songs by the Swedish pop group ABBA. This smash show features the irresistible songs from the Tony Award-nominated Broadway show and hit movie, including: “Dancing Queen”, “S.O.S.”, “Mamma Mia”, “Voulez Vous”, “Take a Chance On Me” and more. In the lead up the May production, The Nelson Daily is pleased to announce the online media news site is showcasing the actors. Today, The Nelson Daily showcases Musical Director Robyn Lamb. Robyn Lamb has been a teacher, music director and accompanist in Nelson and beyond for the past ten years. Some of her favourite projects include Into the Woods, Songs for a New World and Rock of Ages. Currently Lamb is musical directing Black productions Mamma Mia and is the Minister of Music at the United Church. MAMMA MIA is Directed by Pat Henman with Musical Direction by Robyn Lamb and Choreography by Mackenzie Hope. Tickets are $33 for Adults and $28 for students (plus applicable taxes and fees) and are available at the Capitol Theatre box office in person, by phone (250-352-6363) or online at www.capitoltheatre.bc.ca.